I’m writing this to the soul-destroying background of Emmerdale, which will be followed by a torturous visit to Coronation Street. This can mean only one thing; my darling motherbear is visiting. She’s also a recently-diagnosed diabetic, which posed an interesting challenge to a bake-aholic who likes nothing more than to welcome guests with a (large) slab of sugar-laden cake. I tried searching for diabetic recipes, and I did find a few – some with granulated sweeteners, and others with honey or other substitutes. Some just had plain weird lists of ingredients. I’m not keen on the concept of artificial sweeteners – I get hideous images of gargantuan brain tumours just thinking about them – so I had a look on the Weight Watchers website instead, and found this low-sugar cake with only 4 propoints (160 cals) per serving; double win! It’s definitely not the most delicious cake I’ve ever made, but for one with essentially a meringue base with a bit of flour, it’s pretty tasty – and quite light, too. 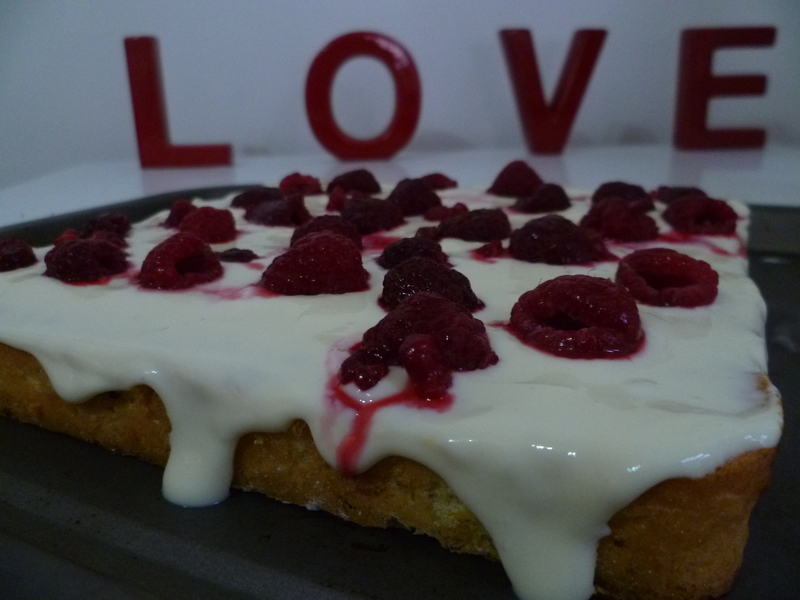 Of course, a (low-fat) lemon cream-cheese frosting and tangy raspberries can hide a multitude of sins. Nevertheless, a rather lovely treat if you’re watching the waistline – and with only 75g of sugar, it could be a viable option for diabetics. I would always recommend checking with the individual, though, as every diabetic is different in what they can and can’t eat. Preheat oven to 190/170 fan/Gas mark 5/and line a 9 inch square baking tin. Gently fold in the flour with a metal spoon and spoon into the tin. Bake for 10-12 minutes until firm but springy. Meanwhile, beat the cream cheese, yogurt, lemon curd and remaining lemon zest until smooth. Chill in the fridge until the cake has cooled. 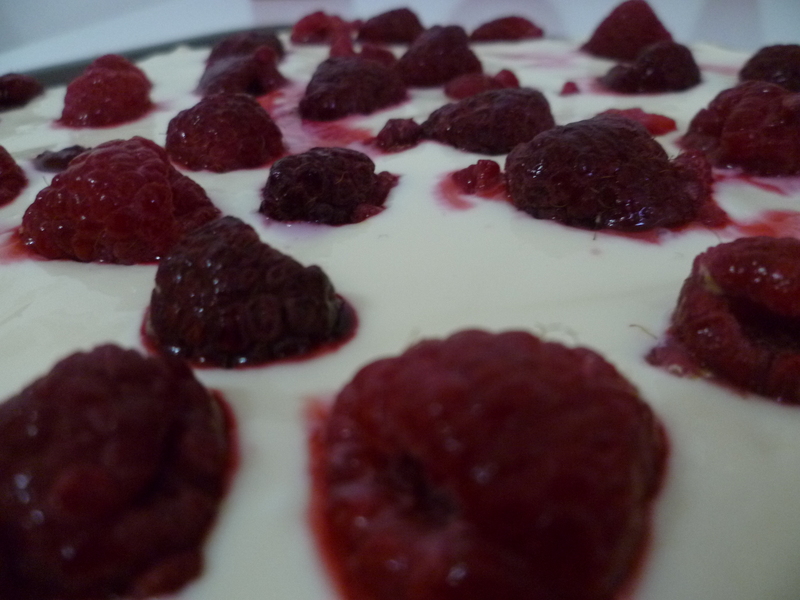 Spoon over the frosting, smooth with a spatula, and decorate with the raspberries, pushing them down a little. Not long finished baking this, it’s wrapped in foil in in the fridge for tomorrow! (We’re going to Derbyshire to see one of my friends, and having a picnic, so the cake is coming with us) Thanks for the recipe, it looks really good (pic is on twitter with you tagged) and my hands smell lovely and lemony! I’ve got a fair bit of icing left so I’ll hopefully make another one this week (only need to buy a lemon and cream cheese for it now) to use that up! However, I think next time I make one proper, I’ll double up the cake mix quantity, it doesn’t seem to make all that much. Also, was surprised by how much whisking it took to thicken the eggs! Though that might’ve been because I was using my big cake bowl and it wasn’t a lot of mixture – it did seem to help when I tipped the bowl a little. Ooh… usually “healthy” and “baking” seem like oxymorons, but they don’t have to be! I’ll have to make this for my mum, too, since she’ll probably be able to eat it and not wail about how she’s gained 5 pounds in the last 5 years.